December 1! That means that the holidays are nearly here - well, I like to celebrate all through December. We have advent calendars too - Titus has one with small gifts that his grandmother prepared, and we each have a chocolate calendar. And I have a special luxury chocolate calendar as well... lucky me! So, I plan to post christmas food, cookies and candy from now until christmas. Maybe a few gift ideas as well, and maybe some christmas-y cookbook reviews. Some will be new, and some will be old. But to kick-start things, try an easy weeknight dinner with holiday flavors: Saffron Carbonara. It's delicious! Start by bringing a large pot of salted water to boil, for the pasta. Cook it to al dente. Meanwhile, in a small pot, bring the 200 ml of water to boil. Add the saffron, and let it simmer on low heat. Fry the bacon until crispy in a large pan. Add the garlic and fry for an additional minute. Add the wine, and let it bubble away. When the pasta is done, drain it but save some of the cooking water. 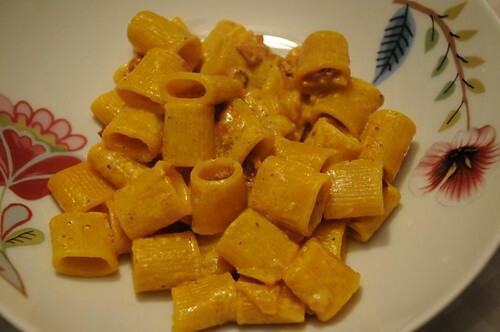 Pour the pasta into the pan, and add the saffron water. Season with black pepper.